Dutch folk dancing – we must be in Poland! Flashing Pole dilemma sorted – both our main-beam headlights were out (we know not why the warning didn’t show on dashboard). All makes sense now, they aren’t just super friendly just warning us we were heading for a fine. Bulbs changed and not a flasher since 😦 . We are still sticking to fairly minor roads, mainly because we tend to see a bit more of the country that way. Mile after mile of straight single carriageway, mile after mile of forests and mile after mile of people trying to kill us playing chicken! They overtake no matter what so its just a case of pulling over as far to the right as possible, forget double white lines – means nothing here. It’s not just the Polish who drive like nutters, cars from Russia, Belarus, Ukraine, Lithuania and United Arab Emirates are all in on the game of terrify the oncoming “passenger on the wrong side” motorhome. Outside the towns the roads are lined with timber houses, many so old they look like they are held up with just good will. The majority though are well kept in large plots with beautiful gardens. Postcard views at most turns, maybe our routes but we have seen very few ugly municipal apartment blocks here even on the edges of the larger towns. In the towns and villages there is a mix of older timber homes and the much grander, newer three or four storey homes. 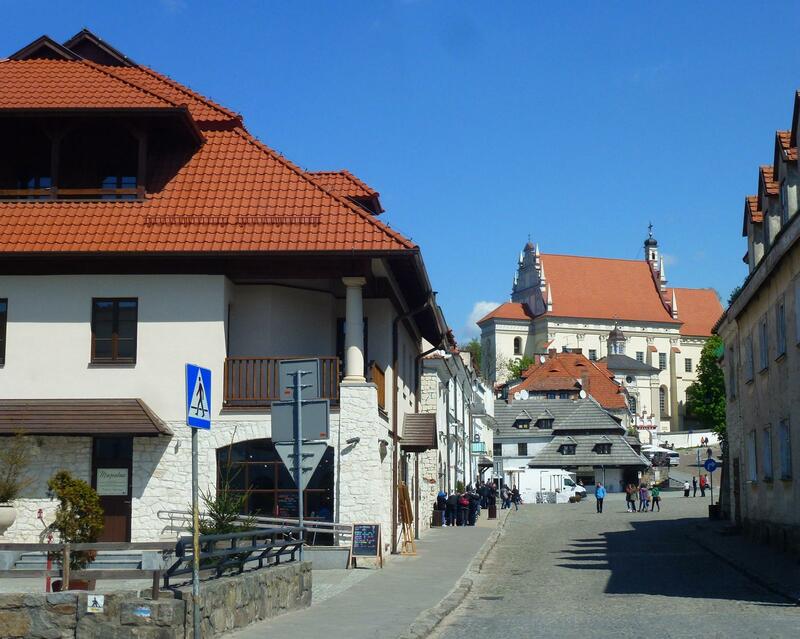 As we drove into Kazimierz Dolny it looked our kind of place; alongside a river, prerequisite town square, castle, couple of major churches etc (why do we get told Poland is ‘new’ as everything was bombed? not where we go it isn’t). 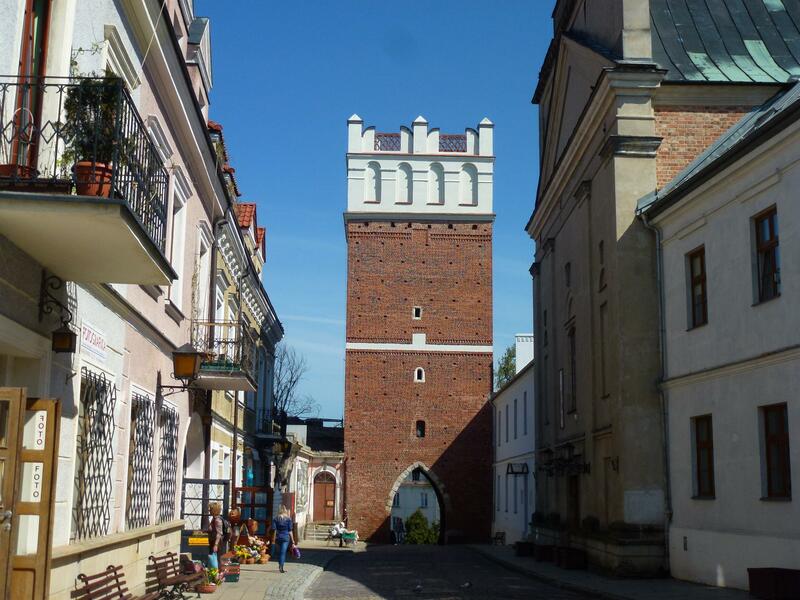 Kazimierz is also famous for artists, at least 50 galleries and shops selling everything from paintings and pottery to stained glass and sculptures – prices to make your eyes water though even if they are in Zloty. In the main square several gypsy women trying their hands at badgering people to have their fortunes read with a pack of old playing cards, when I explained we only spoke English one just shrugged and said it didn’t matter – no idea how that was going to work then? 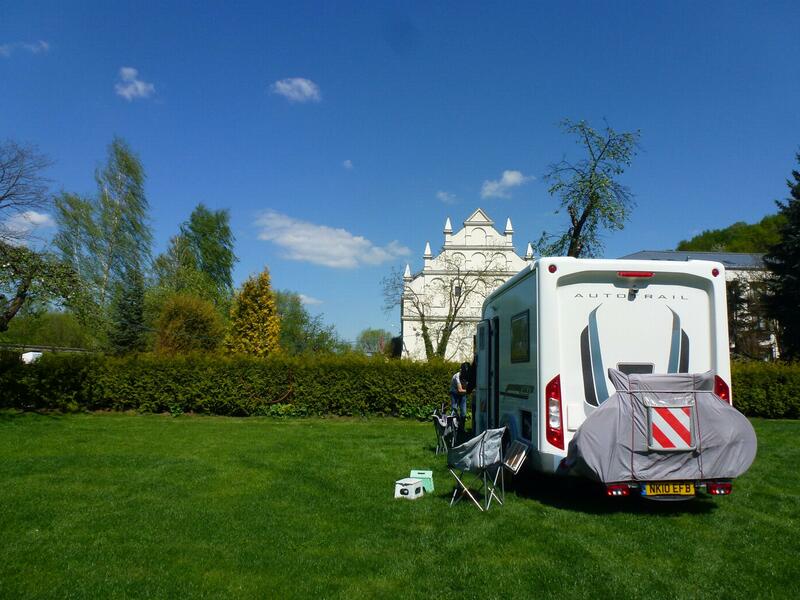 As always a town square clinched it for us, we decided to stay for a few days so time to check out the campsite. Could have been the 2 km long high wire adventure assault course around the top of the site or the 20’ish school kids arriving who were about to use the assault course – it wasn’t for us. As we drove out of town I noticed a motorhome stopover sign, brakes slammed on and about turn. With a lot of gestures and no common language we were booked into the front garden of the familia Grzegorz! 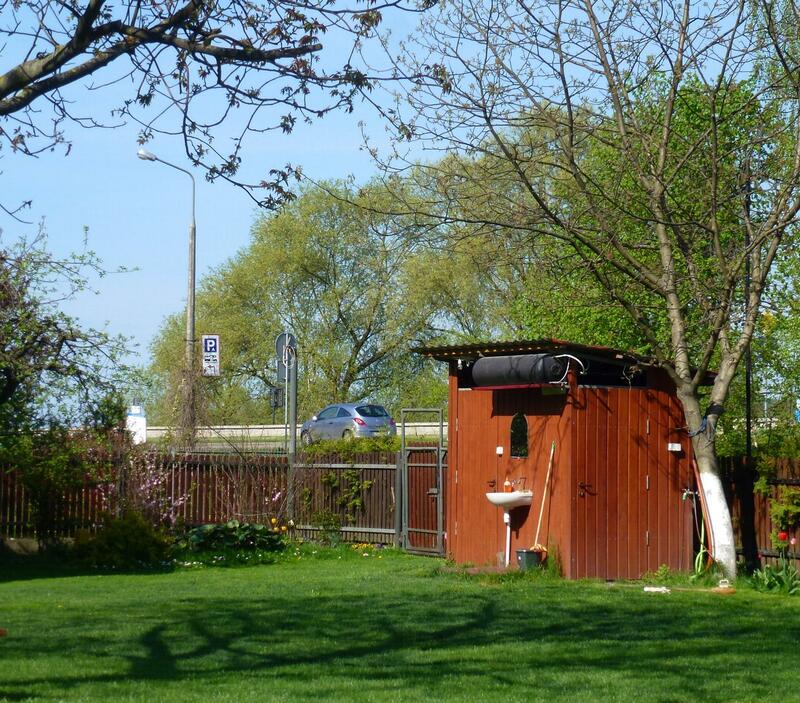 As good as it gets for us – even the outdoor ablutions area where you could wash whilst you watch the traffic passing by. Brilliant cycle paths along the river – some with signs pointing as far as Warsaw, a bit out of our comfort zone. We then took bikes into a historic town, why is a mystery to us even now, it was near impossible to go anywhere without lugging them up steps or the sides of hills. 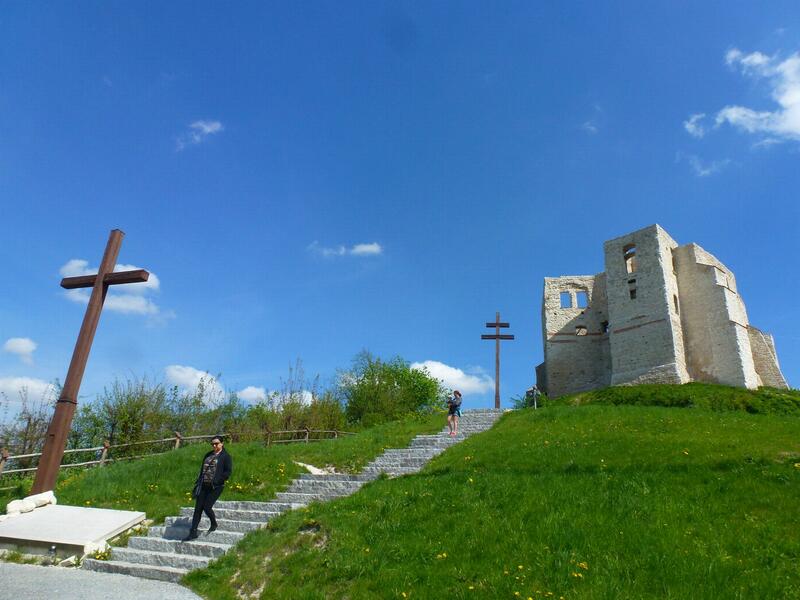 The Three Crosses, dedicated to the memory of plague victims, are on a hill above the town and looked to offer amazing views. We clambered up the hillside steps as far as we could with the bikes, then left them for the final sprint. As I arrived I saw the ticket office! All that way and either pay up of miss out, cheeky sods should have a sign at the bottom. I paid quick before Iain caught up as I knew on principle he wouldn’t want to pay and I was seeing the bloody crosses after all the effort. Then we attempted the castle, being clever we didn’t take the bikes up the steps, we went right to the top of the hill behind the castle on the road, to find the castle closed that day! 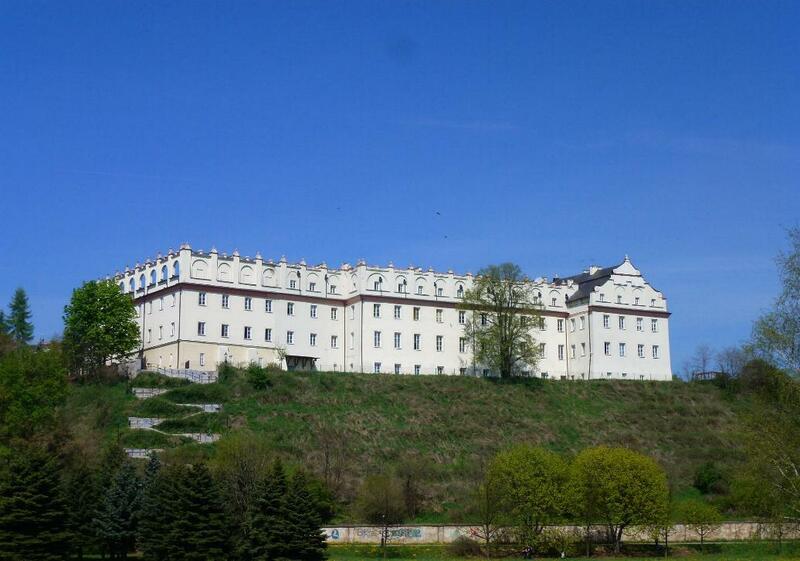 The most loved fact about this place has to be it was founded by ‘King Wladyslaw the Elbow-high’, has there been a better named monarch? The village is recognised as one of the most beautiful in the country and is a very popular tourist destination for the Polish; very easy to see why as there are historic buildings a plenty, cafes, bars and plenty of river cruise boats which appear to carry more alcohol than your average supermarket for a very merry experience. We came across some very authentic looking Polish folk all looking very jolly and approachable. We cycled over and realised they were Dutch! A coach load full who told us they had come to dance in the town square, we went along and watch for a while – tourists loved it, the locals just looked a bit stunned. All this took place whilst local dignitaries arrived in fire engines and flash cars dressed in their finest with gold braid galore and large wreaths of flowers– we thought it was all part of the cultural exchange – but no they were there for a funeral, all very bizarre with the two events taking place at the same time in the square. Dutch Captain Birdseye or what??? 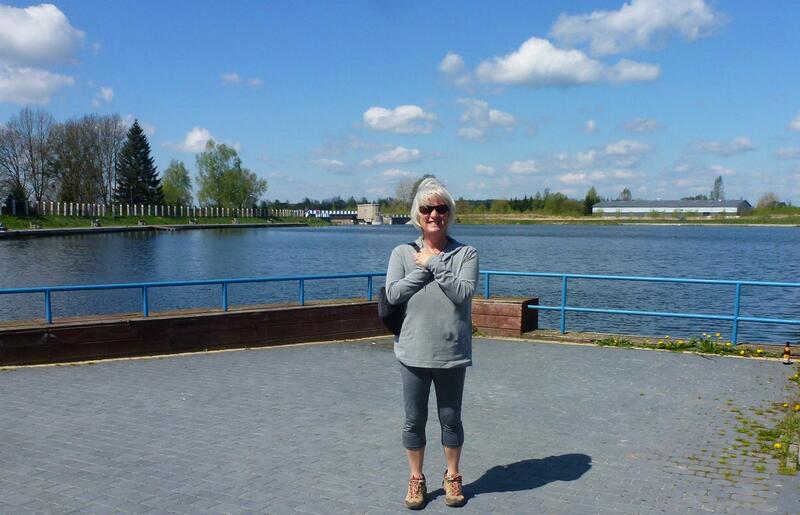 Friday was May 1st – celebrated with a National holiday in Poland – we had no idea until it pinged with the miles of traffic heading towards the river. Three hours later we arrived at a little town where we thought there was a campsite, there was but it has shut down! The next site we knew of was a good couple of hours away, but we decided to continue. Waste of time though as when we arrived there wasn’t a campsite anywhere in sight. Iain popped into a hotel and they told him the site hasn’t been there for 10 years. 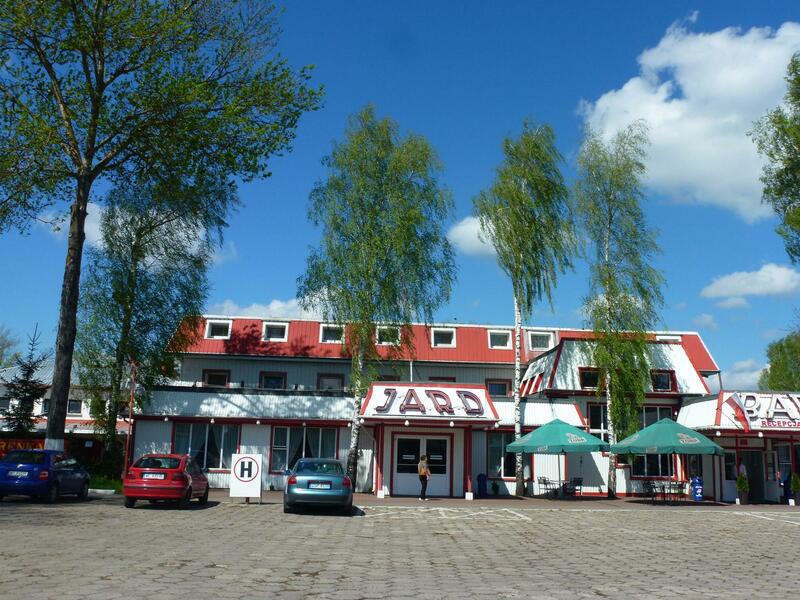 They gave us another address – and that is how we came to be camped at what must be the most authentic Soviet era campsite / hotel complex we have come across to date. 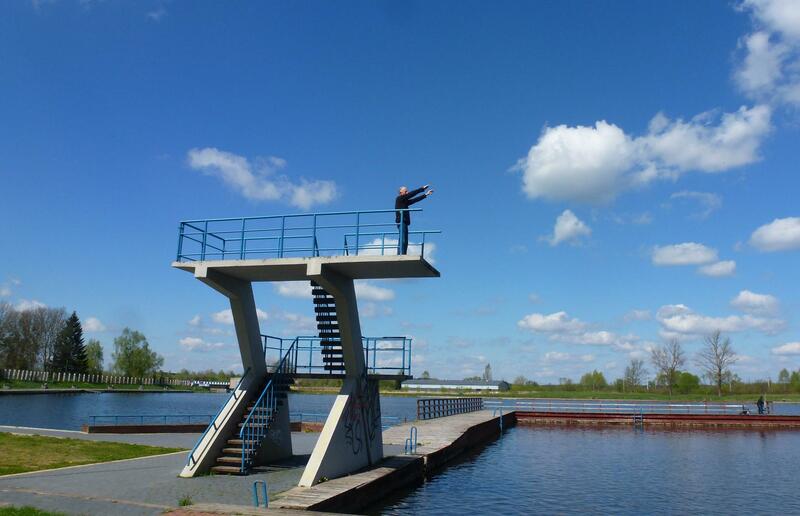 Lots of steel buildings, tons of concrete, a massive lake dug out next door for swimming and of course a concrete diving tower. The facilities were last updated and possibly cleaned when the Soviets ruled the land, but on the upside we have electric, free wifi, and a view of the water for less than £6 a night – we can cope with the dirt! On the car-park is a shop which looked a bit dubious, but inside was the best delicatessen we have seen since France – incredible salads, meats and breads – we bought a ton or so for less than £4 – that’s us sorted for the bank holiday weekend 🙂 . Iain on the high board – na he didn’t! Much as we could have spent another week in Krakow we needed to move on to keep to my well planned itinerary (aka couple of handwritten lines on a sheet of paper). Yet again camper folk proved to be dead friendly, our Dutch neighbours, Francis and Cees, sent us off with a box of tea for Iain as he is running low, then gave us the tea strainer to go with it, along with their address, we hope to stop off in the Netherlands and catch up with them if they are back from their RV tour of Canada. At the Wieliczka Salt Mines we were directed, very formally, into the car-park and charged £4 to park on a grubby old piece of waste land, the real car-park was 100 metres up the road for half the price! You have to give it them for ingenuity, I maintain I would rather they make a few euro from the tourist in a scam like this than pick someones pocket or mug them, we could have driven out but for £2 standing in roasting heat all day they can have my cash. 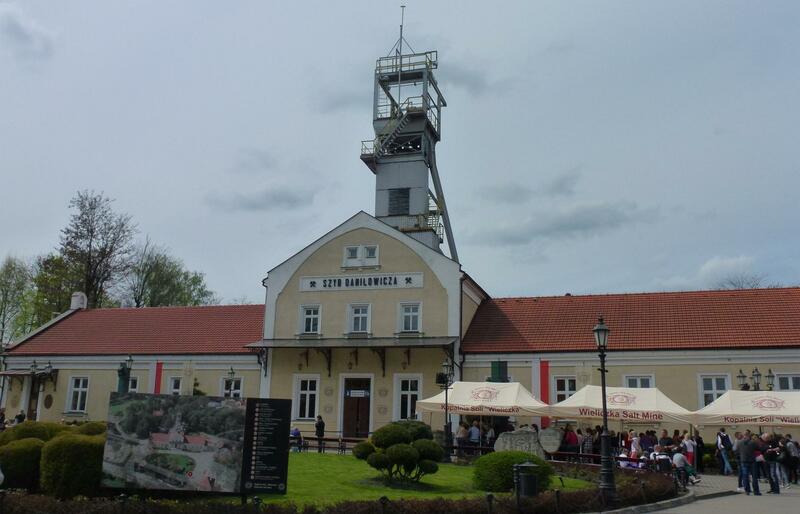 The Salt Mine has been going since the 13th century, the tour takes in various caverns and even two of the chapels carved out of the rock salt by miners. It goes down over 1000 ft, we took the steps down over 300 ft and that was far enough. A very dry and witty Polish guide gave a running commentary in English as we fairly sprinted along the corridors for nearly 3 kms. There isn’t much time to stop, another tour is always right behind you so you are constantly jogged along. We wrapped up warm as it was going to be cold down a mine, saw all the other Brits in shorts and sniggered to ourselves at how clever we were. Wasn’t even slightly cold! we were way hot and pretty sure everyone else thought we were overdressed. 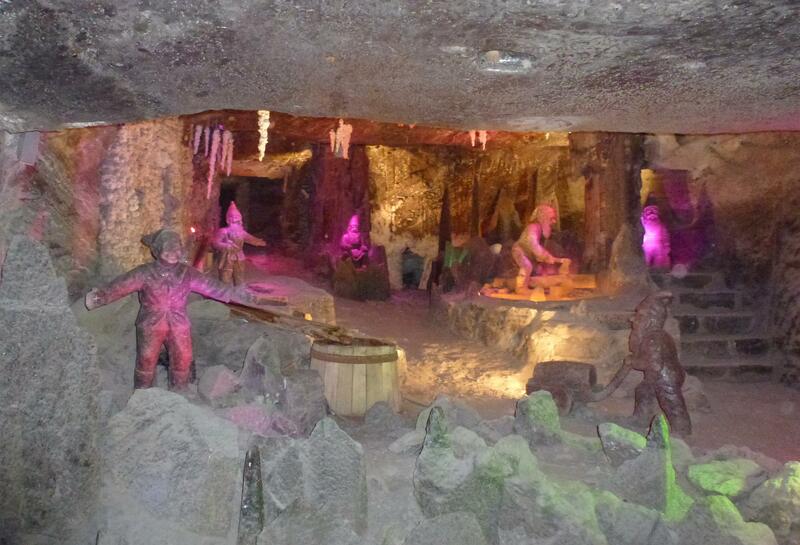 Strangely enough half way through the mines they have built a gift shop and refreshment stop – too commercial and a bit Disneyland, they don’t need gimmicks. The highlight was St. Kinga’s chapel where even the chandeliers are actually made from rock salt and not glass. The tour takes nearly 3 hours and you see less than 1% of the mine, the biggest cash cow we have witnessed so far – stunning to visit but felt like we were on a whirlwind, even at the end instead of just waiting for the lift out another guide took us on a 20 minutes hike around tunnels to keep from queues forming. Even the guide told us the salt used to be a big money maker – now the tourist makes the money. Next stop Sandmomierz, four hours North East, taking mostly minor roads cross country. It’s a small town and another that has faired reasonably well in terms of lack of war damage. As with anywhere in Poland its been invade numerous times – the first time we have come across the Swedes as culprits – they invaded back in 1655. There wasn’t any industrial development during the Soviet era hence its a tourist heaven of historic buildings in beautiful countryside. Other than the history its supposedly famous for its striped flint, which they push in jewellery, ornaments and general nicnaks, as the flint is only found here they have christened the town the “world capital of striped stone” – probably not the catchiest tagline to date! The town square is home to all the usual, pavement cafes and trendy tourist shops. bakeries, a few hotels and a 14th century city hall slap bang in the middle. We strolled around with hardly a soul in sight, then suddenly primary school children started to appear from every side street – hundreds of them all in two’s heading towards the square. No idea what was going on, we made a break for the Opatiwska Gate where Iain climbed the steps to the top – all 30 metres of it, I on the other hand stayed on terra firma. 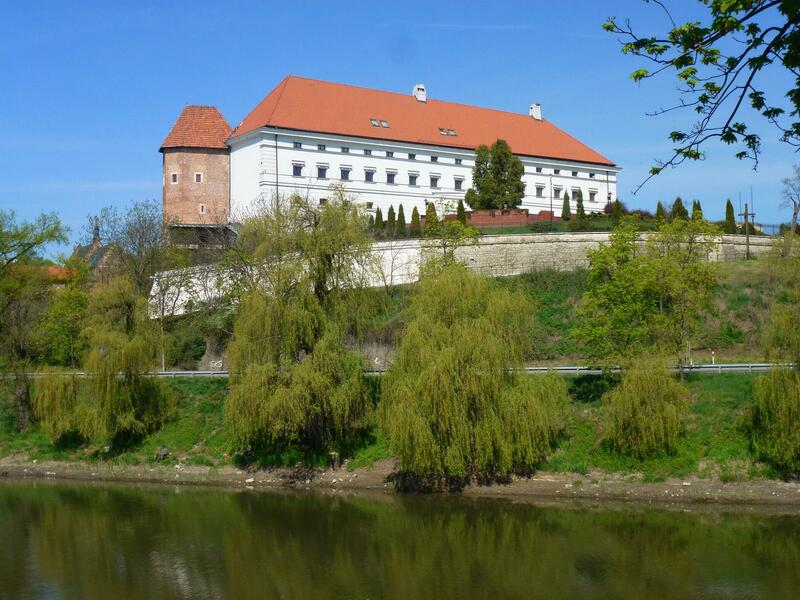 Sandomierz boasts a castle, a cathedral, the oldest college in Poland, a palace and two monasteries. 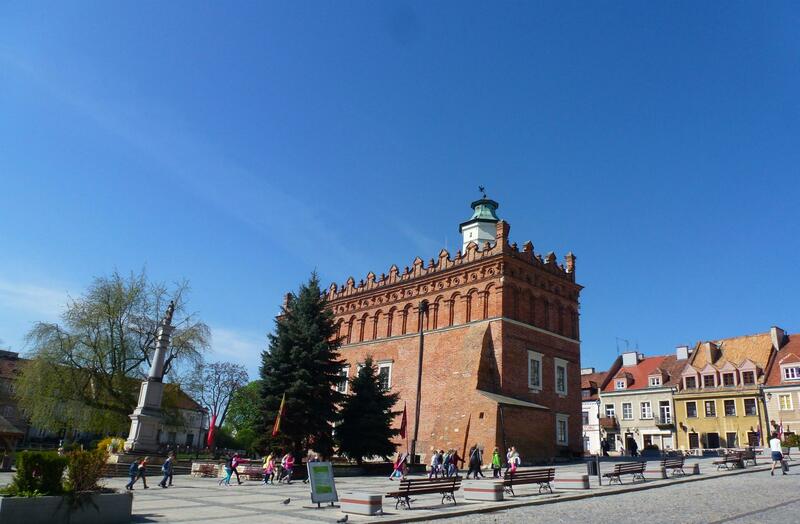 It might not be Krakow but it’s not too shabby on the historic buildings scene. We have been on a lovely campsite on the edge of town, just across the road is a major DIY centre so a bit more stocking up on essentials to hold the van together means we are comfortable of taking all our bits and pieces with us for the next few months. As the budget is looking very healthy we shopped in Carrefour this week, we felt the need to vary our diet a bit, we may go totally mad next week and try Tesco. 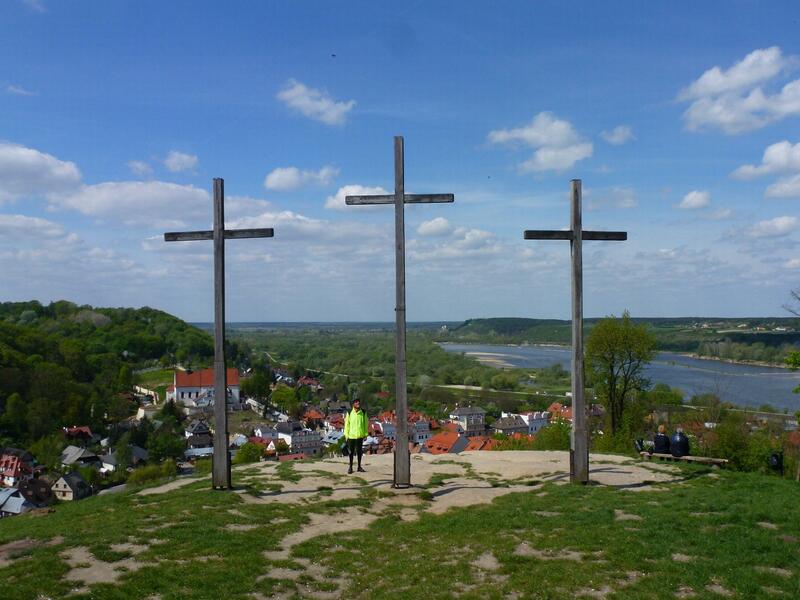 After a day exploring town on foot we set out next day on our bikes for a ride around “The Apple Trail of Sandomierz”. 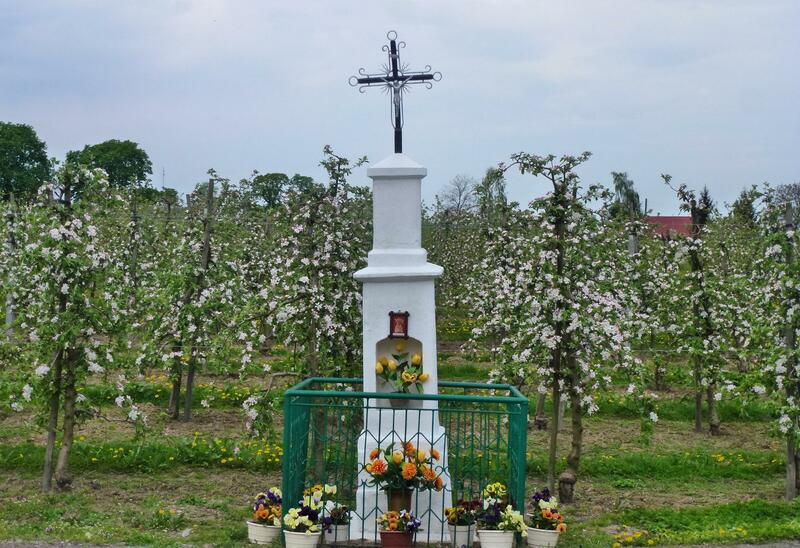 Mile after mile of orchards with old fashioned farm buildings dotted along the roads together with roadside shrines and wooden or stone statues and crosses at every corner. Not sure where we could have found for a prettier bike ride at this time of year with the orchards in bloom everywhere was covered in pink and white blossom as far as we could see. 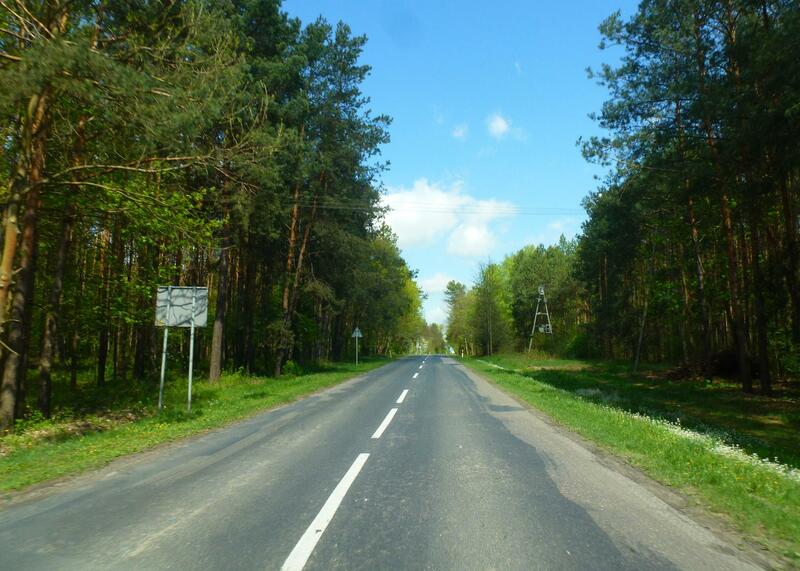 Driving in Poland has, so far, been a pleasure. The roads are great, we can understand the signs as they are in the Roman alphabet and with the exception of one small piece of motorway its toll free. We have found though the Poles have a habit of flashing their headlights at us – we know not why. Once it was as we expected for a police radar trap but only once. Every time we drive someone flashes at us every few miles, we keep thinking something has fallen off the van. They don’t wave or smile, just flash the headlights – it’s probably a game to make motorhome drivers paranoid, if so it’s working :). We have now hit the half way mark of the trip, six months to go. Its all going rather well, we are loving everything and everywhere (easily pleased). Everyone said “it will fly” – it hasn’t – we both feel we have been away for years. What we have experienced so far has exceeded all our expectations and then some. It is without doubt so much easier than we ever thought it would be, once we got over the language /money / driving traumas in one country the others followed on easily. We don’t have a Lonely Planet or a Rough Guide or anything other guide books , we just choose a place on the map that seems the right distance from where we are and in the right direction, we are continually amazed that around every corner is something totally worth seeing. So its nine countries done and possibly ten to go – the plan is still there but as always our motto is “keep it vague”!